Let me introduce myselve. I’m Fien van Wamel, 80 years old, and I live in Dongen. I am a wheelchair user as I have a muscle disease. I also need respiratory support because my respiratory muscles are affected. Last year (May 2010) I met respiratory therapist Ruud van der Wel. It was during a meeting of the Association of Netherlands Muscle disease. He was working there with children to show that anyone can play a musical instrument. He let me “test” to see if I could make music too, a thing that I could not do for about 15 years – I used to play organ and piano. During a holiday of Ruud’s I visited him in Rotterdam. He looked at what I could do. He found that an adjusted electronic saxophone was the instrument for me and I got one on loan. We talked and I agreed that I would find someone who would teach me to play. 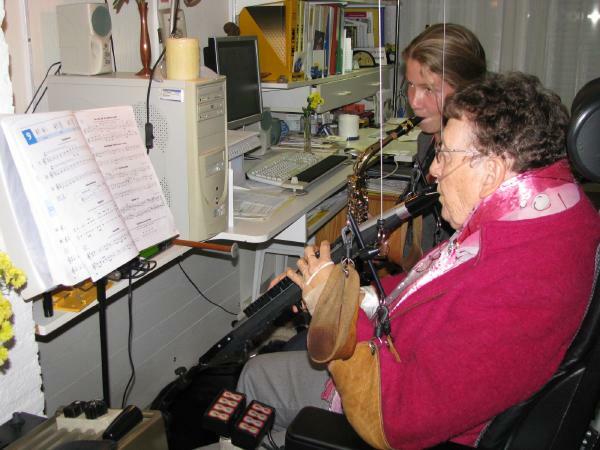 We would also make an appointment during the next holiday so Ruud could see my progress with me playing the instrument. Charlotte is 16 years old and has been playing for 6 years the alto saxophone. She helps me and shows which keys I should use eg the sharps and flats. We have a lot of fun and she has support from her music teacher. I play the sheet music from Ruuds website and sheet music that Charlotte brings. I enjoy playing on the electronic saxophone very much and therefore feel very comfortable. I think anyone who has problems with breathing should give this a try. Go make music! Ruud van der Wel can help you. Ask the doctor for respiratory therapy. Making music is a very pleasant and fun way to do breathing exercises. If you can not hold an instrument, no problem, Ruud fits the instrument on a microphone stand. He even has an instrument that you can play without hands! It’s called the Magic Flute. I have seen children playing it and they had so much fun – it makes me happy. To the children of My Breath My Music I say: I wish you lots of fun music, as I experience it myself. Oh yeah I forgot to say that my breathing problem is not so speedy in decline. I play the stars from the sky. Ruud I wish you all the success with your music. Do not forget to enjoy your profession, you are making young and old happy.